1. Put the stock in a pan and keep warm at a low simmer. Heat 1 tbsp oil in a frying pan. Fry the breadcrumbs and ½ the garlic over a medium heat for about 6-7 minutes, until golden, then season and set aside. 2. Heat the remaining 1 tbsp oil in a large pan. Sauté the shallot, anchovies and remaining garlic over a medium heat until soft and the anchovies have dissolved – about 4 minutes. Add the rice and stir for 1 minute over a medium-high heat. Pour in the wine and stir until absorbed. 3. Add the hot stock, a ladle at a time, stirring constantly until absorbed. 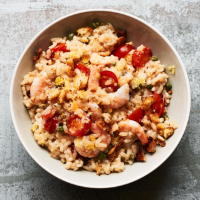 Repeat until the rice is close to al dente; it should take about 18 minutes (you may not use all the stock), then add the prawns, lemon zest and juice, capers and tomatoes; season. Stir until the prawns turn pink – about 2 minutes. Serve scattered with the crispy breadcrumbs.